Specially prepared for puppies and flavoured with tender chicken and hearty beef, it's five-star dining at its best. 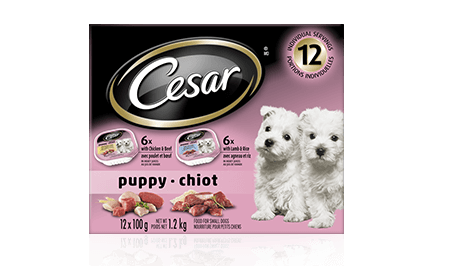 CESAR® PUPPY CANINE CUISINE: 6 LAMB & RICE + 6 CHICKEN & BEEF 12x100g is rated 4.5 out of 5 by 2. Rated 5 out of 5 by Creecree from My puppy loves this Hello, my puppy Dexter (Springer Spaniel) loves the taste, he enjoys half the pack with a handful of dried cookies mixed with the wet. Feed a puppy 3/4 to 2 trays per 2.3KG (5LB) of body weight, 2 times per day. CESAR® Puppy Canine Cuisine with Lamb & Rice in Meaty Juices is formulated to meet the nutritional levels established by the AAFCO Dog Food Nutrient Profiles for growth. CESAR® Puppy Canine Cuisine with Chicken & Beef in Meaty Juices is formulated to meet the nutritional levels established by the AAFCO Dog Food Nutrient Profiles for growth. Lamb & Rice:MEAT BY-PRODUCT, CHICKEN, LIVER, LAMB, RICE, MINERALS & VITAMINS, CHICKEN BY-PRODUCTS, FISH OIL, CARRAGEENAN, DRIED YAM, COLOUR, XANTHAN GUM, NATURAL FLAVOUR, ERYTHORBIC ACID, DL-METHIONINE, GUAR GUM, SODIUM NITRITE (FOR COLOR RETENTION), SUFFICIENT WATER FOR PROCESSING.Chicken & Beef:MEAT BY-PRODUCT, CHICKEN, LIVER, BEEF, MINERALS & VITAMINS, CHICKEN BY-PRODUCT, FISH OIL, CARRAGEENAN, DRIED YAM, COLOUR, XANTHAN GUM, NATURAL FLAVOUR, ERYTHORBIC ACID, DL-METHIONINE, GUAR GUM, SODIUM NITRITE (FOR COLOR RETENTION), SUFFICIENT WATER FOR PROCESSING.